Snack time before Cub Scouts means we need something to tide us over till much later in the evening. We're loving sampling these new Hormel Gatherings Snack Trays we received in our April box from Hormel. The snack tray size is perfect for the three of us to nosh on and we are loving the new flavor options. While the traditional pepperoni and salami remains a favorite, the turkey and ham options are also yummy! Today we had the smoked turkey and cheese version which totally hit the spot and made waiting for a 7pm dinner a lot easier to handle. Check out the Hormel website for other options and coupons too! 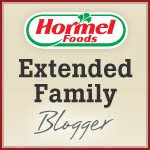 Disclosure: I have received product and information from Hormel Foods in exchange for being a Hormel Foods Extended Family Blogger. No other compensation was received and all opinions expressed within the post are my own.